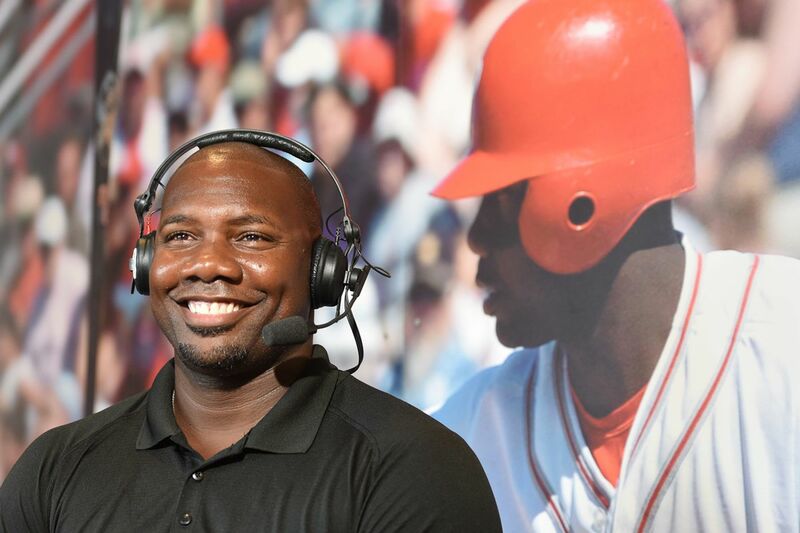 Former Philadelphia Phillies first baseman Ryan Howard sits for a TV interview prior to the Reading Phillies game on Tuesday Aug. 14, 2018, in Reading, Pa.
Former Phillies star Ryan Howard is making his return to Citizens Bank Park Monday, only this time he’ll be in the broadcast booth. Howard, who was hired by ESPN as an MLB analyst in February, will be calling the first game of the Phillies’ three-game series against the New York Mets. Joining Howard in the booth will be play-by-play announcer Karl Ravech and analyst Tim Kurkjian. The game is scheduled for 7 p.m., and will feature Aaron Nola taking on Mets ace Noah Syndergaard. It’ll be the former slugger’s first shot calling a game from the booth after making appearances across a host of ESPN shows in recent months, including Baseball Tonight, SportsCenter, and Golic and Wingo on ESPN Radio. Howard grew up in St. Louis as a fan of sports broadcasting, listening to Cardinals games called by Hall of Fame broadcaster Jack Buck (the late father of Fox Sports’ Joe Buck). But once Howard joined the Phillies, he quickly grew fond of the voice of the team’s legendary announcer, the late Harry Kalas. “It is tough to try to measure up to what those guys did,” Howard said during an ESPN conference call with reporters last month. Howard officially retired from baseball in September 2018 after playing his entire major-league career with the Phillies. Over the course of his 13-year career, Howard was a three-time All-Star (2006, 2009, and 2010), National League MVP in 2006, and a central part of the Phillies’ 2008 World Series championship team. Howard will be honored by the Phillies on July 14 ahead of the Phillies’ game against the Washington Nationals at Citizens Bank Park. The Phillies are also honoring two of Howard’s 2008 teammates this season — Jimmy Rollins (May 4) and Chase Utley (June 21). NBC Sports Philadelphia anchor and Flyers insider John Boruk announced Friday, a week after the end of the Flyers’ season, that he was leaving the network after 13 years. “We appreciate John’s contributions to our network, and wish him the best in his next chapter," NBC Sports Philadelphia said in a statement. Boruk was not available for comment. Boruk is just the latest in a lengthy list of personalities that have departed from NBC Sports Philadelphia over the past few years amid a shifting media landscape, including former Sixers sideline reporter Molly Sullivan, former Sixers insider Jessica Camerato, and former anchor and reporter Marshall Harris. NBC Sports Philadelphia has also added some new faces, including Sixers sideline reporter Serena Winters and multi-platform host and reporter Taryn Hatcher. “Another one bites the dust. Still hate to see it. It was great being desk neighbors with you for all those years,” wrote Rachel Micali, who spent eight years as a booking producer before her position was eliminated in May 2018. Several other NBC Sports Philadelphia personalities weighed in on Boruk’s departure, including Michael Barkann and Derrick Gunn. John- Had a blast working with you- whether on Flyers or DNL/PST. Loved our talks on a variety of subjects- from sports to politics to family. You will be missed. Excited to to see the next chapter for you. Best always, brother. A colleague, A friend, BUT more importantly you're my brother man. One of the most talented and versatile anchor/reporters I've ever worked with. Miss you already bro. I can't wait to see what incredible opportunity comes your way. Our loss will be someone else's gain. Always enjoyed working with you. Nice to have people who love hockey covering the sport. Stick taps for all your efforts over the years. Best of luck and enjoy bringing up a hockey player! • Despite an early start due to the weather, CBS drew big overnight ratings Sunday for the final round of The Masters, thanks to Tiger Woods’ first win in a major PGA tournament since the 2008 U.S. Open. CBS announced it drew a 7.7 household rating (down from last year due to the 9 a.m. start time) and a 21 share (up 17 percent from last year), meaning more than one-fifth of all households with television sets tuned in to watch Woods’ improbable comeback. • NBC’s Mike Tirico, best known for his stint calling Monday Night Football games on ESPN, will call his first NHL postseason game Tuesday, when the Pittsburgh Penguins host the New York Islanders in Game 4 of their first-round playoff series (Islanders lead 3-0). Tirico was widely praised after calling his first NHL game in February.